The UC Board of Regents announced on Monday a “fact-finding review” will investigate allegations made by the state auditor, Elaine Howle, that the UC Office of the President (UCOP) interfered with confidential surveys. The audit alleged four UC chancellors, including UC Santa Cruz Chancellor George Blumenthal, edited surveys to portray the UCOP in a more favorable light under the direction of UC President Janet Napolitano. State auditors sent surveys to all 10 UC campuses in October 2016 to assess UCOP services, the UC system’s Student Health Insurance Plan (UC SHIP) and UCPath, which implemented a single payroll and benefits system for all UC employees. While individual chancellors were told by the state auditor not to circulate the surveys outside of their own campuses, Howle alleges UCOP reviewed them and gave four campuses — UC Santa Cruz, UC Riverside, UC Irvine and UC San Diego — directions to manipulate survey responses before returning them to the auditor. “While we believe we did things appropriately, it is clear in retrospect that we could have handled this better,” Napolitano said at a hearing regarding the audit on May 2. In response to the audit’s allegations, the UCOP initiated an independent review on June 5 to “help determine the facts and offer recommendations concerning this matter,” said UCOP media specialist Stephanie Beechem in an email. The review will be led by former California Supreme Court Justice Carlos R. Moreno and law firm Hueston Hennigan LLP. While Chancellor Blumenthal said he welcomes the review, he will not comment until after it is complete, said UCSC spokesperson Scott Hernandez-Jason in an email. The review’s timeline is not yet determined. The interference with surveys is only one of many unsettled pieces left in the wake of the 167-page audit report. Initiated and approved by the Joint Audit Committee, the report, titled “The University of California Office of the President: It Failed to Disclose Tens of Millions in Surplus Funds, and Its Budget Practices Are Misleading,” reviewed financial and organizational aspects of the UCOP, including its alleged $175 million reserve fund, its “generous salaries and atypical benefits” and spending on systemwide initiatives. 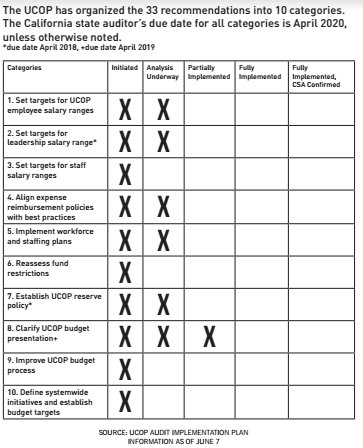 In total, the audit offered 33 recommendations to increase transparency and re-examine UCOP’s “generous” reimbursements of staff expenses such as benefits, travel and meals. The San Francisco Chronicle reported the UC spent nearly $225,000 on private dinners since 2012 and a dinner party in January 2016 with a bill of $13,600 was later reimbursed by UCOP. The UC has since decided not to use university funds to pay for board member dinners and parties, as reported by the Chronicle. Because of findings such as these, the state auditor recommended the UCOP receive increased financial oversight by the state legislature in budget matters, which has spurred firm pushback from the UCOP. “These recommendations threaten the university’s standing as a constitutionally autonomous entity, and the Board of Regents itself,” said UC Board of Regents chair Monica Lozano in a letter to the state auditor. Despite differing opinions and disputes over evidence and audit specificities, the California state auditor has not retracted any recommendations. “We have not made assertions; we have developed conclusions based on evidence,” the state auditor said in the report. As the process of implementing audit recommendations unfolded and demand for transparency increased, the UCOP established a website and a working group, led by Rachael Nava, executive vice president and chief operating officer, to track its progress. “I am sorry that we did it this way, because it has created the wrong impression and detracted from the important fact that we accept the recommendations in the audit report,” said Napolitano.